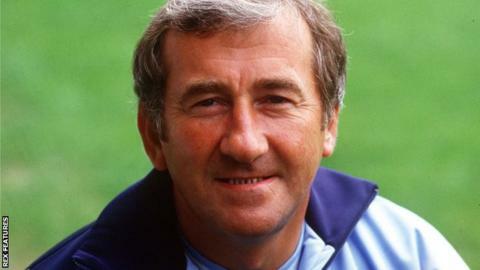 Former Oldham Athletic and Manchester City manager Jimmy Frizzell has died at the age of 79. He spent 12 years in charge at Boundary Park, where he guided the club from the fourth division to the second tier. Before that, Frizzell spent 10 years as a player with the Latics, scoring 56 goals in 318 appearances. He moved to Maine Road as assistant manager to Billy McNeill, taking over in September 1986 after McNeill's exit, in the season when City were relegated. "Jimmy was a true Oldham Athletic legend as a player and manager, and he was a real gentleman," said Latics chief executive Neil Joy. "All Latics fans will feel a real sense of loss at this news. Our thoughts are with Jimmy's friends and family at this sad time."